Gladstone, NJ (May 25, 2017) — Triple Crown® Nutrition, Inc., is proud to congratulate U.S. Olympic Dressage Team Bronze Medalist Kasey Perry-Glass for her most recent accomplishment – claiming the overall U.S. Dressage National Grand Prix Championship title at The Dutta Corp. U.S. Dressage Festival of Champions in Gladstone, New Jersey this past weekend. As the official feed sponsor of the U.S. Dressage Team, Triple Crown is a longtime supporter of equestrian sports and the advancement of U.S. dressage. Dedicated to providing the utmost superiority in nutrition, Triple Crown continually fuels top-level equine athletes. Their first two years at the Grand Prix level have certainly included more than a typical horse and rider’s – Perry-Glass and Dublet’s accomplishments include winning the Grand Prix at the 2015 Palm Beach Dressage Derby, coming in second at the 2016 CDI-W Grand Prix and Grand Prix Special at the Adequan Global Dressage Festival in Wellington, Florida and, most notably, helping the U.S. Olympic Dressage Team to the Bronze medal at the 2016 Summer Olympics in Rio de Janeiro, Brazil. Lexington, KY (May 23, 2017) – It was a rewind of the previous week at the Kentucky Horse Park with Todd Minikus in the money and in the top ribbons again on multiple mounts at the 2017 Kentucky Spring Classic, May 17-22. Minikus again started early with an impressive first place win after an outstanding go on Alex Verlooy’s Carvelo Z in the 135m class. Once again Minikus was on the move riding a bevy of horses. He piloted Elarina owned by the CoverBoy Group to top placings in both the 7-year-old jumping classes. Minikus wrapped up the weekend with a series of successes on clients’ horses as well as a few of his own, including the 8-year-old bay mare JuJu VDM and 9-year-old I Dottori VD Richter owned in partnership with Brems Sport Horses, the striking bay gelding, VDL Excel owned by the CoverBoy Group, and Alice Lawaetz’s chestnut gelding Incitatus — all finishing in the money for their primo performances in the jumper ring. Next Team Minikus heads south to Tryon International Equestrian Center, North Carolina, to get the jump on summer circuit. When not competing nationally and internationally, Todd Minikus offers sales and training services in Wellington, Florida. Minikus, a FEI Nations Cup veteran, is also a U.S. Pan American Games Team Bronze Medalist. Be a part of the action by following Team Minikus on Facebook and Instagram @Todd_Minikus, or visit www.ToddMinikusShowJumping.com. Photo courtesy of Marie De Ronde-Oudemans. Ocala, Florida (May 19, 2017) — Chester Weber, 14-time USEF National Combined Driving Champion, is taking his show on the road – or, more accurately, across the Atlantic – to spend over four months competing in Europe with Jane Clark’s and Weber’s four-in-hand KWPN team. No stranger to international success, Weber has three World Equestrian Games Silver Medals under his belt and made history in 2012 by becoming the first American to win an Individual Silver Medal in the Four-In-Hand FEI World Driving Championships. He won England’s Royal Windsor CAI3* two years in a row and was congratulated personally by her Majesty Queen Elizabeth II. In 2014, Weber made the record books again as the first American to win the Four-In-Hand division at the CHIO Aachen. Weber made another trip to the International winner’s podium in the summer of 2016, when he took top honors at the CAI3* tournament in Drebkau, Germany, and later took third overall at the CAIO4* of the CHIO Aachen World Equestrian Festival in Aachen, Germany. He then rounded out his tournament schedule by finishing fourth individually at the 2016 FEI World Driving Championships for Four-in-Hand in Breda, the Netherlands. Never afraid to test his skills against his peers at the top of the sport, Weber is eagerly anticipating his annual trip to compete in Europe. This summer’s European tour will serve him and his equine team as ongoing preparation for the 2018 World Equestrian Games in Tryon, North Carolina. “We have a couple new horses on the team this year that we feel pretty bullish about, but our big goal right now is preparing the horses for the World Equestrian Games, so that’s what this summer’s about,” Weber stated. Weber knows that being a top contender in Europe will depend not only on his horses’ fitness, but also on himself and his entire team. Weber and his staff have been dedicated to keeping themselves in as peak athletic condition as their horses are. “We take our preparation for Europe very seriously – not only the horses, but the entire team,” said Weber. Weber and Jane Clark’s team of KWPN horses will depart the United States on May 27, and return in early September. Weber will be staying in the U.S. a bit longer than the horses, as his wife just delivered a baby boy, Hugo Wyatt Weber, on May 16. The family will enjoy some quality family time with the newest addition to Team Weber while the horses and the rest of his team settle into their stable in Frankfurt, Germany, which will serve as their home away from home while abroad. This year, Weber’s team includes some younger horses that will be touring Europe for their first time. These newer horses have been proving themselves in their latest U.S. competitions, keeping Team Weber’s dressage scores in the mid-30s. Weber is confident that his team has now hit its stride and is ready to dazzle the judges and fans in Europe. Weber, who continues to be a leading figure in the international world of four-in-hand combined driving, is also dedicated to promoting the equestrian sport wherever his travels lead him. For Team Weber updates, results, photos, and combined driving news, follow Chester Weber on his official Facebook page, Instagram @ChesterWeber, or visit www.chesterweber.com. Lexington, KY (May 16, 2017) — Todd Minikus’ feet barely hit the ground between stirrup irons at the Kentucky Spring Horse Show in Lexington, May 10-14. Minikus competed on a dozen horses over the weekend making a lot of owners happy with top finishes on several horses. Alex Verlooy’s Carvelo Z took the blue in the 135m leading the Minikus jumper charge. Minikus also finished in the money with eight others including Alice Lawaetz’s handsome bay gelding, Incitatus and her fiery chestnut, Sancento, along with four horses owned by The Coverboy Group — Coverboy, VDL Excel, Eldorado VDL, and Elarina — and Chablis S owned by Los Establos Sport Horses. As he did at the 2017 Winter Equestrian Festival this year, Minikus found a few spare minutes to campaign in the hunter rings, as well. Minikus’ own bay gelding Exceptional lived up to his name by earning first place in the Young Hunter 3” & 3’3 class. Though Minikus is a seasoned competitor with well over 100 Grand Prix wins under his belt, his equine partners were a bit newer to the scene. “The highlight of the week was when Alice Lawaetz’s horse, Sancento, jumped clear in his very first Grand Prix. We were very excited about that,” said Minikus. “Hopefully this weather cooperates so we can just keep on moving these young horses up,” commented Minikus. 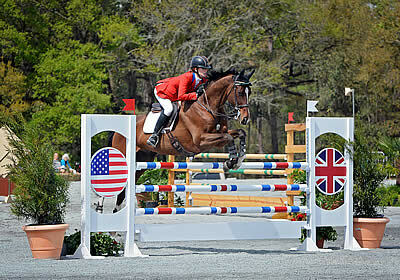 Minikus is now focusing on the upcoming Kentucky Spring Classic, which runs May 17-24 at the Kentucky Horse Park. Team Minikus will then get the jump on summer competition at the Tryon International Equestrian Center in North Carolina. When not competing nationally and internationally, Todd Minikus offers sales and training services in Wellington, Florida. Minikus, a FEI Nations Cup veteran, is also a U.S. Pan American Games Team Bronze Medalist. Follow the excitement of Team Minikus on Facebook and Instagram @Todd_Minikus, or visit www.ToddMinikusShowJumping.com. Jacksonville, FL (May 19, 2017) — The public is invited to the Jacksonville Equestrian Center in Jacksonville, Florida Saturday, May 20, for a day packed full of free activities for the entire family. The final day of the Extreme Mustang Makeover will be held simultaneously at the Jacksonville Equestrian Center, with several free events leading up to the Top 10 Freestyle Finals (a ticketed event on Saturday evening). The exciting Free Family Fun Day will kick off early on May 20 at 8:00 am, when the Jacksonville Mustang Car Club will drive up to the Jacksonville Equestrian Center in unique mustang vehicles. Over fifteen mustangs will be on display during the event, alongside another type of mustangs – horses. The famous Extreme Mustang Makeover will introduce spectators to wild mustang horses who have spent the past 100 days with a trainer to prepare for the weekend’s competition. The Extreme Mustang Makeover is open to the public at the Jacksonville Equestrian Center from May 18-20. From 8:00 am to 4:00 pm on May 20, the Extreme Mustang Makeover trail class and freestyle competition for youth trainers and their mustangs will take place. Cool down in an Olympic-sized pool adjacent to the Jacksonville Equestrian Center anytime from 9:00 am to 6:00 pm on May 20, when the Cecil Aquatics Center will be open for swimming. There will be a $1.00 fee for Duval country residents, and a $1.50 fee for all other swimmers. At noon, the festivities will jump into full swing with a free bounce house, free petting zoo, free pony rides, free face painting, free balloon animals, and a free magic show. These kid-friendly events will wrap up at 4:00 pm. Jacksonville’s popular radio station Gator Country 99.9 FM will arrive on site at 1:00 pm. Gator Country’s Matt Basford will broadcast live until 3:00 pm, offering plenty of prizes. Prizes will include buy-one-get-one-free horseback riding coupons for the nearby Diamond D ranch, concert tickets, tickets to the Extreme Mustang Makeover Top Ten Freestyle Final on Saturday night, and more – so make sure to stop by to see Matt! From 4:00 pm to 5:00 pm, the horses and trainers from the Extreme Mustang Makeover will be in the Jacksonville Equestrian Center barns, ready to greet anyone interested in meeting real mustangs face-to-face. At 4:45 pm, doors will open to the facility’s enormous indoor coliseum for the much-anticipated Extreme Mustang Makeover Top 10 Freestyle Finals. The mustang and trainer pairs selected as competition finalists will perform amazing and entertaining feats in front of the crowd, vying for the winning title. Tickets to this event will be available at the door and are also available online at https://tix.extremetix.com/webtix/4300/event/69306. Tickets are $15.00 plus tax. Veterans will receive a $5.00 discount, and children under five years old are free. The Jacksonville Equestrian Center is pleased to offer the local community a day packed full of activities and exhibitions on Saturday, May 20. To learn more about the Jacksonville Equestrian Center, which is home to community, recreational, and equestrian events year-round, visit www.jaxequestriancenter.com or call Alexis Newman at (904) 993-2053. Wellington, FL (March 21, 2017) – Dressage duo Katherine Bateson-Chandler and Alcazar delivered an electric winning performance during Friday night’s FEI Grand Prix Freestyle CDI 4*, presented by Havensafe Farm, at the 2017 Adequan® Global Dressage Festival in Wellington, FL. The pair earned a score of 73.325% as Alcazar’s snappy hocks hit every beat in Bruno Mars’ “Uptown Funk,” rocking them into first place in the Friday night FEI Grand Prix Freestyle class. Bateson-Chandler and Alcazar, a 2005 KWPN gelding (Cantango x Polina) owned by Jane Forbes Clark, have hit the ground running in this year’s competition series, having earned a score of 71.88 percent in the CDI-W Grand Prix earlier this season. Last July, Alcazar (affectionately known as Lonzie in the barn) suffered from colic after the pair completed their Grand Prix ride at the World Equestrian Festival CHIO in Aachen. Alcazar underwent a successful surgery, and the pair worked patiently towards his recovery with the hopes of competing again once he had returned to full health. Since reuniting in the show ring this winter, the two have been unstoppable, earning exceptional scores that culminated in Friday night’s victory. Bateson-Chandler’s many career achievements include being a member of the 2016 Gold Medal Dutta Corp. U.S. Team at the FEI Nations Cup, and being part of Team USA at the 2016 CDIO3* Odense Nations Cup in Denmark. In 2010, she represented the U.S at the Alltech FEI World Equestrian Games in Lexington, Kentucky riding Nartan. The team finished fourth and, individually, she and Nartan qualified for the Grand Prix Special. Bateson-Chandler hopes to claim a spot on the U.S. team at the World Equestrian Games to be held in Tryon, North Carolina in 2018. Through her business KBC Dressage, Bateson-Chandler offers training and coaching services, as well as dressage prospect selection for clients. For more information about Katherine Bateson-Chandler, visit her on Facebook and on the web at www.kbcdressage.com. Tallahassee, FL (March 17, 2017) — Omega Alpha Ambassadors Hannah Sue Burnett and Selena O’Hanlon handily won their divisions at the Red Hills International Horse Trials CIC three-star competition in Tallahassee, Florida this month. Omega Alpha Pharmaceuticals, a company that produces all-natural equine health supplements, sponsors both riders and was thrilled to congratulate them on their victories. Burnett rode Harbour Pilot to win the international CIC3* division. Harbour Pilot is a 14-year-old Irish Sport Horse gelding (Cruising x Shannon) owned by Jacqueline Mars. The pair began with an excellent dressage score of 44.10. In the warm-up arena for the stadium jumping phase, Harbour Pilot threw in some excitement by bucking Burnett off – but she hopped back on and the pair completed a clear round with only two time penalties. On a difficult cross-country course, they were again clean over fences, gaining only 8.8 time penalties. The Omega Alpha Ambassador won the competition with a final score of 54.9 – which was 12 points ahead of her nearest rival. No stranger to besting competition, Burnett has been on many USEF High Performance Training lists. She won individual silver and team gold medals at the Pan American Games in 2011, and in 2012 was USEF National Champion at the Fair Hill CCI3*. She lives and trains in The Plains, Virginia. O’Hanlon, from Kingston, Ontario, has a long list of accomplishments, including being a member of the 2008 Canadian Olympic Eventing team and the 2010 World Equestrian Games (WEG) silver medal team. She was also a member of the sixth-placed 2014 WEG Eventing team. As to the future, O’Hanlon says that she and Woody will go back to their winter base in Ocala, Florida to prepare for The Fork at Tryon before going on to the Rolex Kentucky Three-Day Event in Kentucky. Wellington, FL (March 12, 2017) – As an enthusiastic supporter of the sport of dressage and an annual sponsor of the Adequan Global Dressage Festival, Piaffe Performance was delighted to honor dressage rider Ann Romney with the Piaffe Performance Adult Amateur Achievement Award at the Wellington, Florida show series. The award is presented to select adult amateurs who show a sincere and unyielding passion for the sport, and who have persisted to overcome obstacles in pursuit of their equestrian goals. The extraordinary Ann Romney, who juggles her role as a horsewoman, mother, grandmother, avid philanthropist, and former first lady of Massachusetts, accepted the award from Dr. Cesar Parra, owner of Piaffe Performance. Riding her brand new horse, Dalhems Diomedes, a 12-year-old Swedish Warmblood gelding (Belissimo M x Ferusa, Flemmingh), Romney earned first place in one Prix St. Georges class and second place in another in the national/amateur division of the 2017 Palm Beach Derby at the Adequan Global Dressage Festival. The story behind Romney’s path to the world of dressage is truly a remarkable one. After she was diagnosed with multiple sclerosis in 1998, Romney became determined not to let her battle with the debilitating disease keep her from achieving her goals of becoming a rider. Despite considerable physical difficulty, Romney fought her way into the saddle day after day, and eventually found a renewed sense of peace and replenishment in riding. Not surprisingly, working with horses continues to keep the disease at bay, and Romney maintains that working with horses was just the medicine she needed. After riding with dressage Olympian and trainer Jan Ebeling in clinics, she was struck with the beauty of dressage and began learning from Ebeling as often as possible. Romney not only became a successful rider herself, but also became a sponsor of Ebeling’s international riding dreams. He rode on the U.S. dressage team at the 2012 Olympics in London on her mare, Rafalca. In addition to maintaining an active riding career, Romney also finds time and energy to devote to her family and political life, having been an active participant in her husband’s U.S. presidential campaigns in 2008 and 2012, when he was the Republican Party nominee. Romney is also a committed philanthropist, championing The Ann Romney Center for Neurological Diseases at the Brigham and Women’s Hospital in Boston. The center of 250 scientists focuses on research into Alzheimer’s disease, multiple sclerosis, amyotrophic lateral sclerosis, Parkinson’s disease, and brain tumors. Given her outstanding character and dedication to the equestrian life, Romney was a perfect fit for the Piaffe Performance Adult Amateur Achievement Award, which is presented at the Adequan Global Dressage Festival throughout the duration of the winter competition season. Dr. Cesar Parra, who presents riders like Romney with this honor, has represented the United States in the 2011 Pan American Games, where he helped secure a team gold medal. He was also on the U.S. team at the 2014 World Cup in Lyon, France. In addition to sponsoring the Wellington winter show season, Parra also campaigns his top horses throughout the competition. Piaffe Performance provides full-service training based on classical German methods at locations in Jupiter, Florida and Whitehouse Station, New Jersey. To learn more about Parra, his Piaffe Performance team, training, and lessons, visit www.Piaffe-Performance.com or find them on Facebook @PiaffePerformance. Ocala, FL (March 15, 2017) – Ocala’s native combined driver Chester Weber reigned victorious this weekend, navigating his KWPN team to his 14th USEF Combined Driving Four-in-Hand National Championship on Sunday, March 12, at the 26th annual Live Oak International. After a show-stopping performance in the dressage phase with an impressive 36.51 score, Weber forged ahead to win the marathon phase with a 112.96. Team Weber then rounded out the week with the cones phase to finish with a final score of 154.70. Weber was quick to credit his horses for the victory and thank his sponsors, and emphasized how pleased he is with the newest members of his and Jane Clark’s hand-picked KWPN driving team. “Bastiaan and First Edition ‘Edison’ are fairly new additions to the team and they have clearly proved their merit. This is the first time we have had this group out together in competition. Finding that balance with utilizing the developing horses for competition and making sure we are as prepared as possible can be tricky, but I am pleased with the team’s performance,” Weber said. As Co-President of the Live Oak International competition, Weber commented on the challenges of juggling his responsibilities as a competitor with his responsibilities as the ringmaster of the largest combined driving and show jumping event in the United States. The competition, set amidst the picturesque rolling hills of the Weber family’s country estate in Ocala, was once again an exciting event for top equestrians and spectators alike. This year’s legendary competitor’s party was circus-themed, raising the bar yet again for next year’s Live Oak International weekend. Be sure to check out the pictures from the competition and Saturday’s circus extravaganza on www.Facebook.com/LiveOakInternational. Follow Team Weber’s tournament schedule on www.ChesterWeber.com as he prepares to take on competition in Europe this summer. Learn all about Weber’s latest results, favorite equestrian products, and his star four-in-hand team on his official social media sites on Facebook and Instagram @ChesterWeber. Wellington, FL (March 14, 2017) – Multiple high scores and first place titles have been the norm this winter show season in Wellington, Florida for the Piaffe Performance Farm team of dressage riders. Led by founder and owner Dr. Cesar Parra, the Piaffe Performance team is known for its consistent record of excellence, and accumulating a wealth of blue ribbons at this year’s Adequan® Global Dressage Festival only further confirms that Piaffe Performance is a force to be reckoned with. Parra’s team of international riders are showing their skill in the saddle and experience under pressure, and the spectacular horses they are campaigning have demonstrated that they are on top of their game. Parra, a 2011 U.S. Pan American Games Dressage Team Gold medalist, is racking up the blues aboard the eight-year-old Westphalian mare Belle Ami (Belissimo M x Reebook). During the first week of the Adequan Global Dressage Festival, which began on January 11, 2017, Parra earned two scores over 70 percent, securing a first place in the USEF Developing Prix St. Georges class. He and the bay mare were again unstoppable in the third week, topping the leader board with two more wins in the same division. The pair placed second in the FEI Prix St. Georges during the fifth week, and capped the seventh week with another first place in the USEF Developing Prix St. Georges, along with a high score of 74.412 percent. Belle Ami is owned by Parra, Brooke Centrella, and George Feldman. Don Cesar, the seven-year-old chestnut Westphalian gelding (Desperados x Manhattan) owned by Parra’s wife Marcela Ortiz, is showing remarkable progress. Parra wowed the judges with multiple scores in the high 70’s in the FEI Young Horse 7-Year-Old division. He garnered three first place ribbons during competition in the fifth and seventh weeks of the series, posting a high score of 77.910 percent. He then rode away as winner of the FEI Young Horse 7-year-old final. Parra and Fashion Designer OLD (Faustinus x De Niro), a nine-year-old Oldenburg gelding owned by Martin Sosnoff, executed a superior performance in his first ever FEI Intermediate II class, capturing the blue ribbon with a score of 69.211%. Katie Riley, who joined Cesar Parra’s team in 2000, is one of the founding members of Piaffe Performance Farm. She is an accomplished Grand Prix rider and USDF Bronze, Silver, and Gold medalist. Riley and Sir Beckmann, an up-and-coming five-year-old bay Hanoverian gelding, won the FEI Young Horse Final for 5-year-olds with a 76.000 percent. Owned by Parra, Sir Beckmann (Sir Donnerhall x St Pr Witchita) is quickly mastering skills, with a promising dressage career ahead of him. Twenty-seven-year-old Piaffe Performance rider Roberto Brasil joined the team in 2014. Originally from Portugal, Brasil is an 11-time Azores Dressage Champion and a Portugese Cup Silver and Bronze medalist. He and Whoopie Gold, a 13-year-old chestnut Oldenburg mare (Wolkentanz II x Romancier) opened the first week of the show season by winning both of their FEI Intermediate II classes with a high score of 68.289 percent. Not to be outdone, Merita Hagren partnered with the Dutch Warmblood Amigo to win two Fourth Level tests. Amigo (Turbo Magic x Jammy) is a grey, 12-year-old gelding owned by Parra’s student Martin Sosnoff. Hagren also rode two Fourth Level tests aboard Don Cesar during the third week of the season, earning a high score of 71.216 percent and placing third in both classes. Originally from Finland, Hagren has been with Piaffe Performance for three years. With extensive experience training various breeds, she specializes in riding young horses and training them up the levels in dressage. Throughout the season, Piaffe Performance Farm has consistently supported not only its own riders but also successful adult amateur competitors at the Adequan Global Dressage Festival. Piaffe Performance is presenting the Piaffe Performance Adult Amateur Achievement Award to honor riders who contribute to the sport of dressage through sincere sportsmanship and high-quality horsemanship. The award will be presented throughout the competition series, which concludes on March 25, 2017. Piaffe Performance produces horses and riders that have earned numerous prestigious accolades both nationally and internationally. Now decorated by this year’s high scores, ribbons, and awards, Piaffe Performance is excited to continue its winning ways throughout the remainder of the season and then the spring and summer months. Dr. Parra and his team – with locations in Jupiter, Florida, and Whitehouse Station, New Jersey – invite riders to learn more about training and lessons by following the Piaffe Performance official Facebook page or visiting www.piaffe-performance.com.